This wedding album page shows a collection of images from a wedding at the Cutlers Hall in Sheffield. In the first image the brides has given out thank you gifts to her bridesmaids, these are some wonderful locally made bracelets fashioned from items of cutlery, in this case fish knives. In the second and third images the bride emotionally greets her father at the door to her hotel room, this is the first time he has seen her wearing her wedding dress and is a significant moment for any parent, particularly the father of the bride who frequently hasn't before seen the bride in her wedding dress. The next image shows the bride and her father walking from her room down to the hotel reception area in the Leopold Hotel on Leopold Street in Sheffield. The fifth image on this wedding album page spread shows the groom and his groomsmen waiting on the steps of the Cutlers Hall to greet the wedding guests for this Sheffield City Centre wedding. 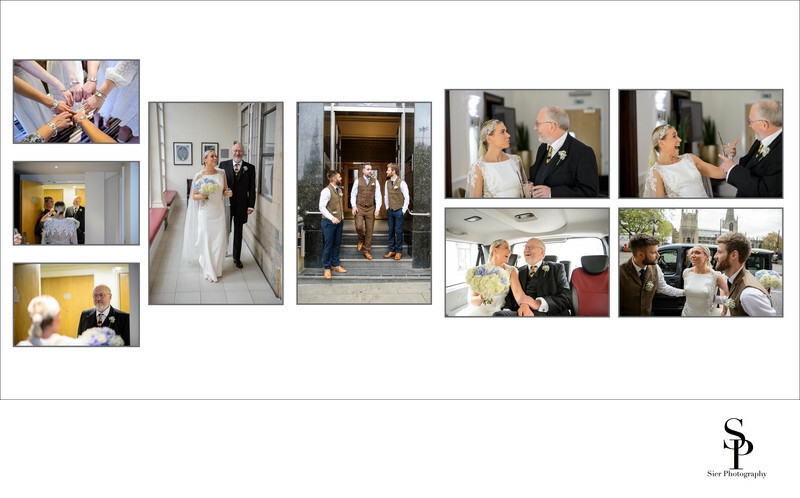 The next two images are of the bride and her father waiting in the reception area of the Leopold Hotel for their transport to the wedding venue. The bride and her father share a joke together in a specially commissioned taxi to the Cutlers Hall. The final image on this page is of the bride arriving with her father at the Cutlers Hall and being greeted by the waiting groomsmen.